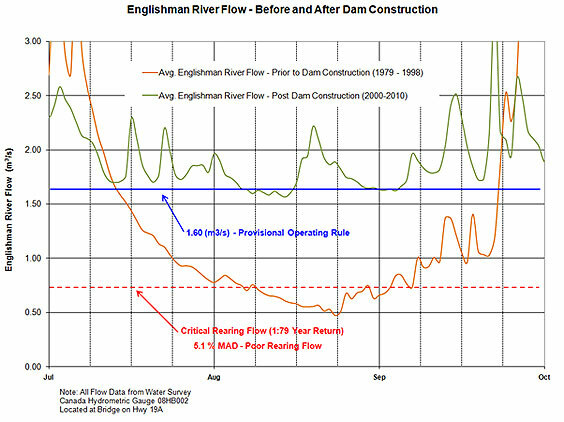 The figure below shows an average of daily flows in the Englishman River, as measured above Highway 19A, before and after construction of the dam. Since construction of the dam, a significant increase in summer flows can now be maintained in the river, even during dry summer periods. Of critical importance from both a fisheries and drinking water viewpoint is river hydrology. The watershed, in general, is at a low elevation and only the upper areas receive a significant snow pack. As a result, river flow tends to be strongly influenced by rainfall patterns, as demonstrated by how, prior to construction of the Arrowsmith Dam, river flows would drop to very low levels during the driest periods of the summer. 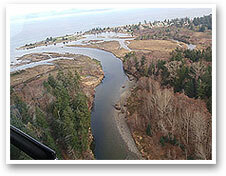 The Englishman River is primarily used by the AWS partners to supplement their groundwater supplies. For treatment, Englishman River water supply is currently chlorinated for protection against microbial contamination. Low chlorine residual is maintained throughout the distribution system to ensure that the quality of the water supply is maintained. In green, flow available after the ultimate water extraction (1.13m3/s) - 40 year horizon, for improved fish enhancement. As part of exploring future water resources on a regional basis, senior government determined that the best approach was for the City of Parkville, Regional District of Nanaimo and the Town of Qualicum Beach to look to the Englishman River for the main source of surface water supply rather than developing supplies on separate surface water sources. 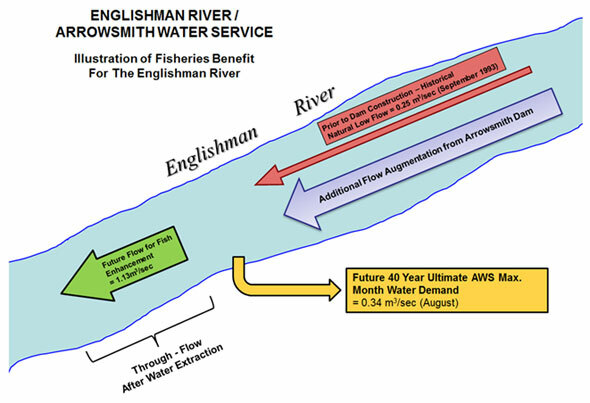 Given that all the water licences on the Englishman River were allocated at that time, the AWS needed to provide storage for bulk water extraction and for fisheries benefits. The current Water Licence No. 110050 in the name of the three AWS joint venturers reflects our bulk water needs with the conditions of providing additional flows for fisheries benefits. 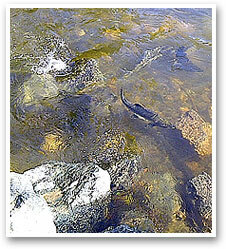 The Englishman River provides habitat for five species of salmon and three species of trout. 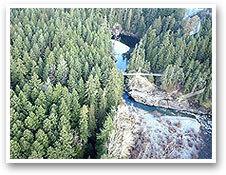 It is also one of Vancouver Island's major steelhead rivers. Protecting and enhancing this fish habitat is important to Arrowsmith Water Service partners. Approximately half the water that is stored in the Arrowsmith Lake reservoir is for fisheries purposes, to supplement low summer flows in the Englishman River. Along with the water released for consumption and domestic use, this additional water creates better spawning and migration conditions for the fish in the river. In accordance with the requirements of its water licence, the AWS works cooperatively with federal and provincial fisheries departments to manage the additional summer flows.